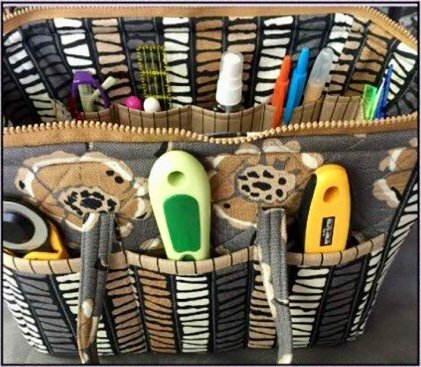 This is the perfect bag for quilters. Pockets all around on the outside, pockets all the way around on the inside. Heavy duty metal stays (included in the pattern) keep the bags mouth wide open for easy access to all your important tools. Be sure to pick up the supply list, pattern and pre class instructions when you sign up for the class.